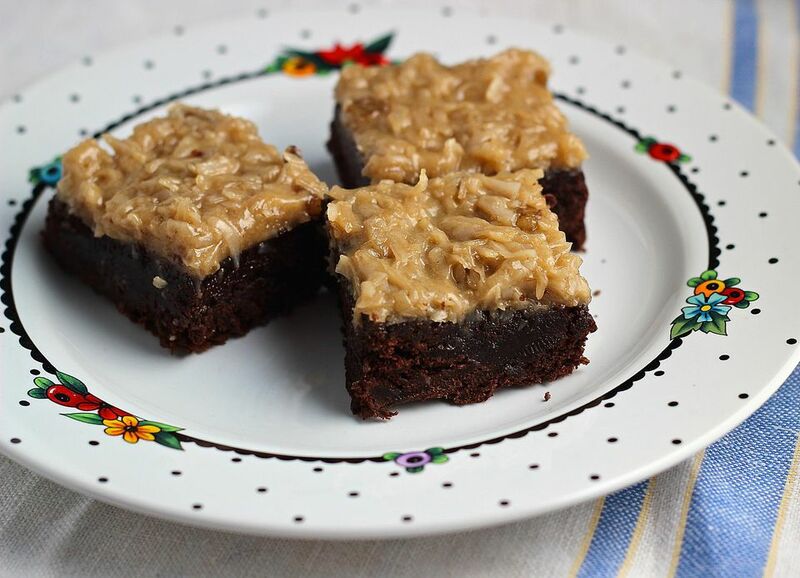 German chocolate brownies are not only made with German sweet chocolate, but they are topped with a rich creamy frosting made with brown sugar, cream, coconut, and pecans. This combination of textures and flavors is usually used in German Chocolate Cake, but I changed the recipe to add a special touch to brownies. This brownie is perfect for Christmas, or it's a great addition to a cookie tray. It will also sell quickly at a bake sale. Follow the directions carefully for the best results. Preheat the oven to 350°F. Spray a 13" x 9" pan with nonstick baking spray containing flour and set aside. In a large saucepan, combine 2/3 cup butter, 1/2 cup sugar, 1/2 cup brown sugar, and water. Bring to a boil, stirring frequently. Remove the pan from the heat and add the chopped chocolate; stir until melted. Add 2 teaspoons vanilla and the eggs, beating well to combine. Bake for 30 to 40 minutes or until brownies are just set. Set aside. For the topping, combine 1/4 cup melted butter with 1 cup brown sugar, coconut, pecans, corn syrup, heavy cream, and 1 teaspoon vanilla in a medium bowl; mix well. Carefully drop this mixture by small spoonfuls onto the warm brownies; spread gently to cover. Turn the oven to broil. Broil the brownies 6" from heat for 2 to 3 minutes or until the topping bubbles all over. Watch carefully, since it can burn easily. Remove the brownies from the oven and cool completely on a wire rack; cut into bars.